Delivery time: This item will normally ship within four business days of order placement. A blank notecard can be used to deliver a million different messages. This one, featuring an image of our recently installed mural at Tucson City Hall, has a true Arizona vibe. Whether it's a simple thank you, a love letter, or just to say hello, these notecards perfectly fit the bill and give a nod to the state that we at Ben's Bells love, Arizona. Kindness: signed, sealed, and delivered! 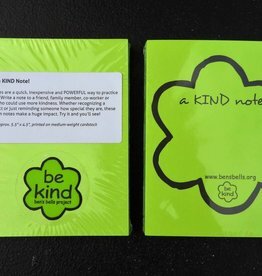 Kind Notes are a quick, easy and inexpensive way to practice kindness.